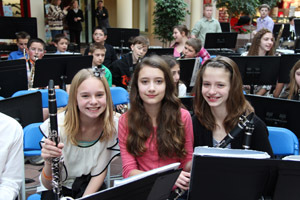 Holiday music filled the air for shoppers on Dec. 18 when EJD students performed at Great Northern Mall. Pictured are Sixth grade band members Alex Galle, Hailey Goudy and Julianna Lewis outside of Macy’s. Students in sixth, seventh and eighth grade performed for over an hour, to the delight of onlookers. The sixth grade band performed “A Christmas Proclamation,” a number they had been working on since September. The seventh and eighth grade band played the popular “Carol of the Bells,” and “Cyclone,” a song that featured a thunder sheet. Before they were bused back to school to resume their classes, middle school students had time to eat lunch at the mall. 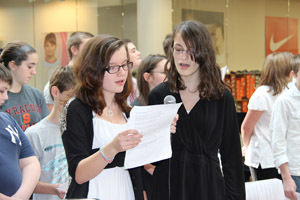 Singing a duet of “Have Yourself a Merry Little Christmas,” are EJD eighth grade students Crysania Gilbert and Rebecca Burdick.